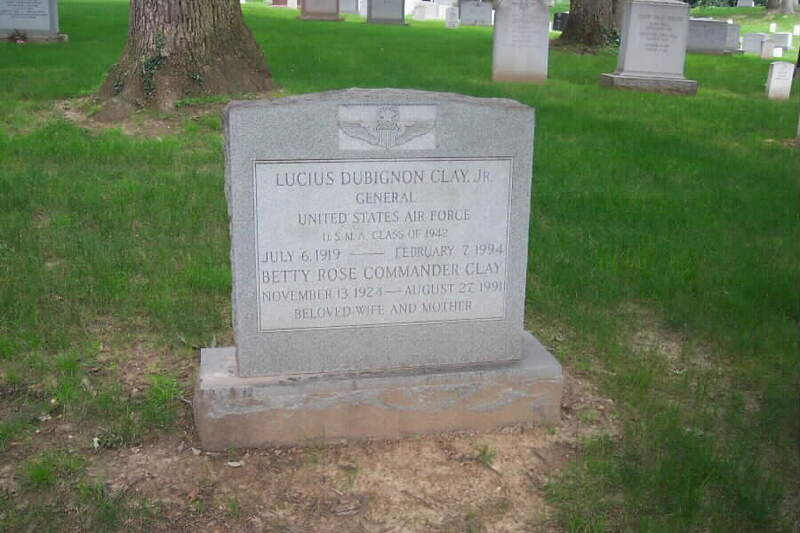 Lucius D. Clay, Jr., a four-star Air Force General who directed Air Force combat operations in Vietnam and later headed North American Air Defense Command, died last Monday (February 7, 1994) at Alexandria Hospital in Virginia. He was 74 and lived at Fort Belvoir, Virginia. The cause of death was cardiac arrest and emphysema, family said. In 1973, he was named Commander In Chief of the North American Air Defense Command and the Air Force Aerospace Defense Command, making him responsible for air defense of the North American continent. He retired two years later, ending 37-year career that featured some of highest positions and honors afforded by the military. General Clay was born July 6, 1919 at Alexandria, Virginia. His grand-father was Senator Alexander Stephens Clay of Georgia, and his father was General Lucius D. Clay, Sr. After World War II, the senior General Clay, who died in 1978, commanded US forces in Europe, served as the military governor of the US sector of occupied Germany and was a force behind the 1948-49 Berlin airlift and the rebuilding of West Germany. Like his father, the younger Clay attended the United States Military Academy, graduating in 1942. He took flight training and earned his pilot's wings that year. In England, the young officer commanded a bomber squadron and flew combat missions against Germany. After the war, be became Deputy Commander for base services with the European Air Depot. He returned to the U.S. in February 1947, having by then risen to rank of Lieutenant Colonel, and he transferred to the Air Force, which had recently become a separate branch of the military. He served in several positions at the Pentagon, attended the Air War College and Air University, and held posts that included chief of the Plans Division of the Strategic Air Command and Commander of the 12th Air Force, Tactical Air Command, in Waco, Texas. assuming the command of the 7th Air Force, based in South Vietnam, and overseeing air bases throughout mainland Southeast Asia. In September 1970, he became a four-star general, and in August 1971, he was named Commander in Chief of Pacific Air Forces. During his career he received more than twenty medals and service awards, including Distinguished FLying Cross, the French Croix de Guerre and the Purple Heart. He was awarded the Distinguished Service Medal five times and had two Joint Service Commendations. At the end of his life, he lived at a military retirement community at Fort Belvoir, Virginia. 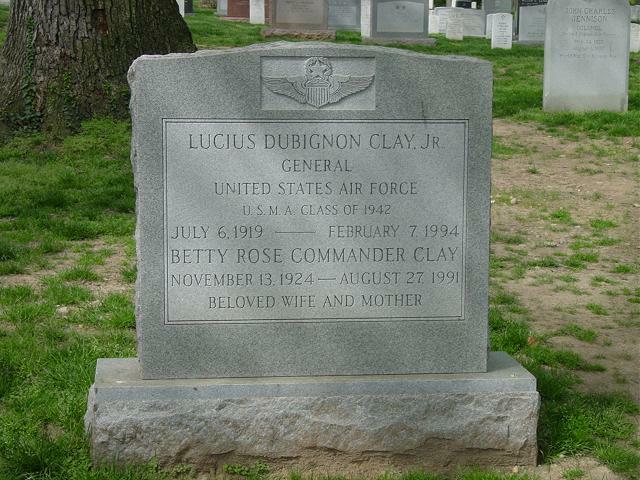 His wife, Betty Rose Commander Clay, died in 1992. He is survived by four children, Dr. Lucius D. Clay III of Princeton, New Jersey, State Senator Charles C. Clay of Marietta, Georgia, Carla Berry of New Rochelle, New York, and Dr. Colin McK Clay of Fort Collins, Colorado. His brother, Major General Frank B. Clay, retired, of Chevy Chase, Maryland, and six grandchildren. Services will be held on Thursday, February 10, 1994 at 11:45 am at Immanuel Church-on-the-Hill Church, Seminary Chapel, 3737 Seminary Road, Alexandria, Virginia. Interment at 1 pm in Arlington National Cemetery. July 6, 1919-February 7, 1994. He and his wife are buried in Section 30, Grave 497. 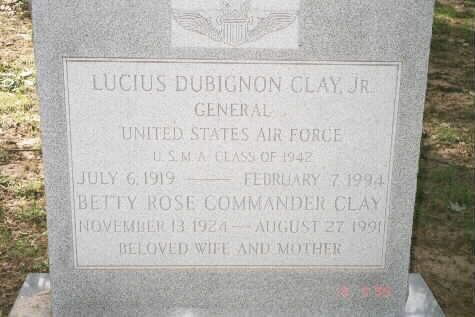 GENERAL LUCIUS D. CLAY JR.
General Lucius D. Clay Jr., was commander in chief, North American Air Defense Command, a military command consisting of United States and Canadian air defense forces with headquarters at Ent Air Force Base, Colo. He also serves as commander in chief, Continental Air Defense Command, the United States element of NORAD; and as commander, U.S. Air Force Aerospace Defense Command. General Clay has operational command of all United States and Canadian strategic aerospace defense forces. He is responsible for air defense of the North American continent, for global aerospace surveillance and warning assessment of hostile attack from space. General Clay was born in Alexandria, Virginia, in 1919. He graduated from Western High School, Washington, D.C., in 1937, and from the U.S. Military Academy, West Point, New York, in 1942. He then entered flight training and received his pilot wings at Lubbock Field, Texas, in December 1942. He next attended B-26 transition school at Fort Worth and Del Rio, Texas, where he later became an instructor. In June 1943 General Clay went to MacDill Field, Florida, and assumed command of the 616th Bombardment Squadron, and two months later joined the 495th Bombardment Squadron as assistant operations officer. He moved with the squadron to Lakeland, Fla., Hunter Field, Georgia, and then to the European Theater of Operations. From June 1944 to February 1946, he served with the 344th Bombardment Group as operations officer, squadron commander, and group commander. Following World War II, General Clay remained in Germany and served as deputy commander and deputy for base services with the European Air Depot, Erding, Germany. In February 1947 he returned to the United States to serve on the staff of the Deputy Chief of Staff, Operations for Atomic Energy, Headquarters U.S. Air Force. From June 1949 to May 1952, he was assigned to the Air University and Air War College at Maxwell Air Force Base, Alabama. General Clay returned to the Pentagon in June 1952 as an Air Force member of the Joint Strategic Plans Group in the Organization of the Joint Chiefs of Staff. He later was assigned as chief of the Joint Plans Division, Deputy Chief of Staff, Operations, Headquarters U.S. Air Force. He went to Ramey Air Force Base, Puerto Rico, in July 1956 where he served as deputy commander of the 72d Bombardment Wing. In May 1958 he was assigned to Headquarters Strategic Air Command, Offutt Air Force Base, Nebraska, as chief of the Plans Division. From February 1961 to August 1964, General Clay once again served with the Organization of the Joint Chiefs of Staff. His first assignment was as a member of the Joint War Games Control Group, and later he served as Deputy Director for Operations. In August 1964 he was transferred to Waco, Texas, as vice commander, Twelfth Air Force, Tactical Air Command, and in January 1966 he was named commander. In July 1966 General Clay returned to Headquarters U.S. Air Force to become director of plans under the Deputy Chief of Staff for Plans and Operations; in August 1967 was assigned as director of aerospace programs, Deputy Chief of Staff for Programs and Resources; in August 1968 assumed the position of deputy chief of staff, programs and resources; and in August 1969 became deputy chief of staff, plans and operations. General Clay was assigned as vice commander in chief, Pacific Air Forces, from February 1970 to September 1970 when he assumed command of Seventh Air Force with headquarters at Tan Son Nhut Airfield, Republic of Vietnam. He also was deputy commander for air operations, U.S. Military Assistance Command Vietnam. As Seventh Air Force commander, he was responsible for all Air Force combat air strike, air support and air defense operations in mainland Southeast Asia. In his MACV capacity he advised on all matters pertaining to effective use of tactical air support and coordinated Vietnamese air force and United States air operations of all units in the MACV area of responsibility. General Clay became commander in chief, Pacific Air Forces, in August 1971. He assumed his position as commander in chief, North American Air Defense Command/Continental Air Defense Command and as commander, Aerospace Defense Command, October 1, 1973. His military decorations and awards include the Distinguished Service Medal with three oak leaf clusters, Legion of Merit; Distinguished Flying Cross; Bronze Star Medal; Air Medal with 10 oak leaf clusters; Joint Service Commendation Medal with oak leaf cluster; Army Commendation Medal; Purple Heart; Croix de Guerre Avec Etoile de Vermeil (France) with Gold Star; National Order of Vietnam, Third Class; Republic of Vietnam Air Force Distinguished Service Order, First Class; Korea National Security Medal; and Republic of Vietnam Cross of Gallantry. He is a command pilot.